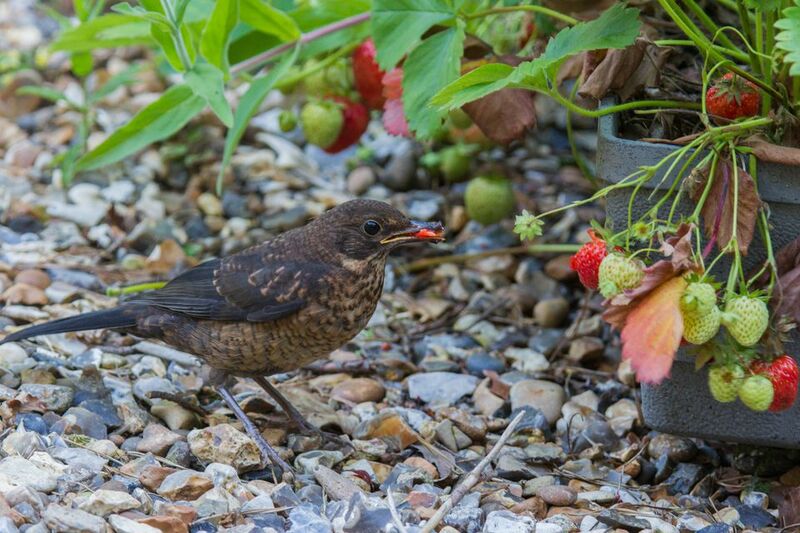 Birds like to feed on strawberries, raspberries, blueberries, and whatever other edible fruits you might be growing. These garden and orchard fruits are as tasty and nutritious to birds (and many other creatures) as they are to us. In rural areas and in commercial orchards or fruit farms, there are sometimes lethal methods taken to protect fruit crops from invaders from the sky. But few urban or suburban gardeners want to plink songbirds with a BB gun, even if it is legal. And before taking any measures at all to chase birds away, you should consider the fact that those birds may be present to eat insects that are damaging your berries. The same measures you use to keep birds away from the berries is also keeping them from eating insects that might be the more serious enemies. The mere presence of birds in the area does not mean those birds are actively eating berries. Before taking counter-measures, make sure you are actually witnessing the birds eating your fruit. There are several humane ways to keep your berry crop safe from neighborhood birds. Here are a few of the best. Flash tape is basically what it sounds like: strips of Mylar or foil tape that flutter in the breeze, scaring the birds off. The birds don't like the shine of the tape, and anything that moves is good for keeping birds out of the area. Pros: Foil tape is inexpensive, humane, and relatively unobtrusive. The idea behind this method is the same as the Mylar flash tape: shiny, moving objects will frighten any hungry birds from the area. To use this method, simply tie some string through the hole in a CD (or make a hole in a pie plate and thread string through it) and hang it from a fence or post near your berries. Pros: Movement and shine will frighten most birds off. This method also provides a great opportunity to recycle, since you can use old CDs and used aluminum pie plates. Cons: This is almost anything but unobtrusive. And, as with the flash tape method, if birds are very hungry, this method won't deter them for long. This is probably the most fool-proof method for keeping more of the berry harvest for yourself. By draping netting over your berry bushes and small fruit trees, you prevent birds from getting at the vast majority of the berries. For low crops, like strawberries, floating row cover frames can support netting to shield the berries from birds. Taller berry bushes can be protected by pop-up screens sold by garden supply retailers. Pros: Birds can't get to most of the berries. Bird netting is fairly inexpensive. Cons: Small birds may get inside the netting and get caught. Also, the berries on the outer edges of the plant will still be accessible to the birds, so you'll have to accept some losses. The idea behind this is straightforward—birds see a supposed predator (a bird of prey, a snake, or a human scarecrow) near the berries, and they won't go near them. Garden supply stores sell a number of different inflatable or cardboard scarecrows of owls, hawks, or snakes to use in the garden. To make this work, you need to move the scarecrow to a new position in the area every few days. Even the birds will figure out eventually that the scarecrow isn't moving. Pros: Scarecrows can add a certain sense of whimsy to a garden, and they do a decent job of scaring off many birds off. If some part of the scarecrow moves, such as a tie that flutters in the breeze, it will work all the better. Cons: Birds will eventually realize that the scarecrow isn't real and will ignore it to feed on your berry patch. Moving the scarecrow frequently can delay this. A common theory is that when birds raid your berry patch, they aren't hungry as much as they're thirsty. The high water content in berries makes them an ideal target for thirsty birds. By having a birdbath nearby, you give them what they really want, and they leave your berries alone. This will work even better if you can add the sound of water, through the use of a dripper or fountain. Pros: Birdbaths will bring a wide variety of backyard birds to your yard, and many of these birds feast on insect pests. Cons: If the birds really are just hungry, you've provided them with a full meal instead of just a drink. The principle behind this idea is that if you give the birds their very own food, they'll leave yours alone. Place a feeder or two in close proximity to your berry patch, and the birds will go to the feeders instead of raiding your crop. Pros: As with the bird bath idea, inviting birds to the garden can help you control insect pests. Cons: If you aren't careful about keeping the feeders full once you've attracted hungry birds, they could very well notice the luscious berries nearby and feast on them. The bird feeder may increase the number of birds in your garden. Having a radio in your berry patch or near your grapevines will create enough noise to frighten hungry birds away. Pros: Noise does frighten birds off. Cons: Having a radio on all day can get annoying for both you and your neighbors. Also, once the birds get used to the noise, they won't be shy about investigating your garden. Maybe the best solution is just to accept that you will have losses, and plant many more berry plants or grapevines than you actually need. The birds get their share, you get yours, and everyone's happy. Pros: If you over-plant, you're practically guaranteed to get at least some berries from your garden. Cons: There's no guarantee that the birds won't just go ahead and devour everything before you get a chance to harvest your share. Any method you choose is likely to give you some success in protecting your berry or grape harvest, although the best long-term solution, by far, is to use netting over your berry crop. The harvest time for birds is generally a short one—about the same time it is for humans harvesting berries. You will not have to worry much in the early days of berry formation and ripening. Only at the point where the berries begin to ripen will you need to double-down on your efforts to keep birds away. But also remember that backyard wildlife is one of the joys of gardening. Birds can help us by devouring pest insects and they add an element of living beauty to the garden. By trying these simple, humane methods of protecting your berries, you can coexist peacefully with our feathered friends. Does Red Mulch Help Tomatoes Ripen Faster?